Greetings! Here I am, ready to post in the brief half an hour I have until I have to go to my little brother's show of some sort. Oh, what fun. You may notice a small hint of sarcasm highlighted by my use of the word 'Oh' and the lack of exclamation mark. The truth is that today I am really very tired, having had a maths GCSE retake this morning and the prospect of too much coursework over the next seven days. To top it all off, I can feel the cold hand of 'possibly doing some sort of homework or revision', put it's feverish fingers tighter around my neck. The first photos show how great two simply shades can be. E.g. Orange and Pink. I am actually worried that I am not going to make any point in this. All there will be is me rambling to the tune of some wonderful photos of hair. Maybe my point is A) Give it a go if you want to. You only live once after all... or B) You may not like it but you should really appreciate the artistry. After all, being different is what makes the world an interesting place. 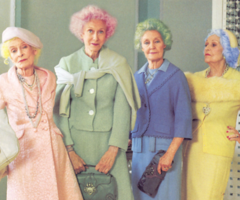 It would be really quite boring if we were all dressed the same. 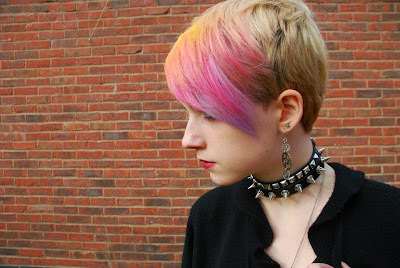 What I like about coloured hair is the way it can finish an otherwise rather dull, or rather monochrome outfit. It is not purely done by alternative people. 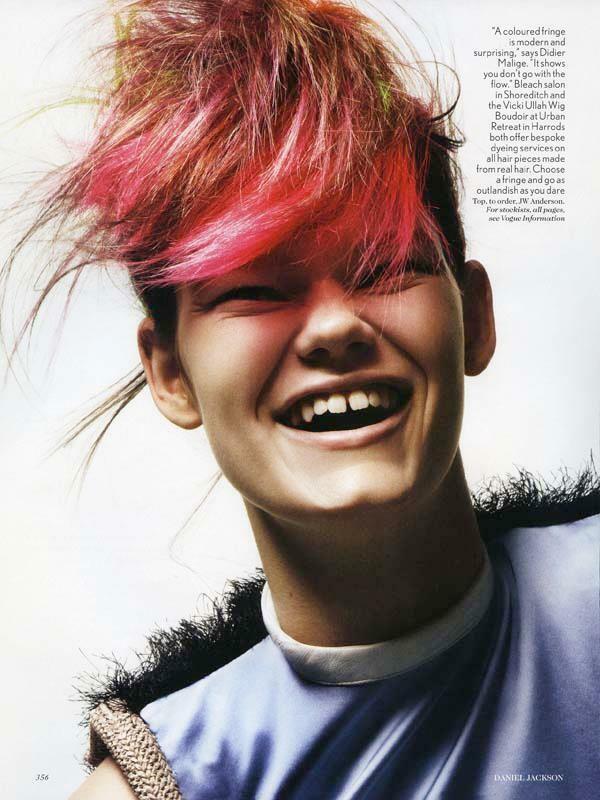 After all many designers such as Vivienne Westwood (bad example of non-alternative) but also Marc Jacobs, Duckie Brown and Thakoon Panichgul among a much larger selection, have used coloured hair on their runways. 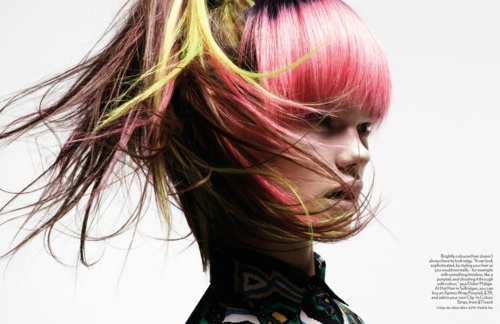 Oh, and the ends-only option is quite fashionable at the moment for a less out there example. Here is my friend, Aggi, displaying her amazing style (she did the hair herself, which in itself - in my mind - deserves a round of applause) and great colour palette. Also proving how easy (or not, that sort of contradicts my previous statement) it is to do. Might not be a look I'm trying any time soon. A) I am not allowed. B) I have not got the guts.... but I think the photos are truly gorgeous and I do not in any way regret having to beg to use them. Which do you prefer anyway? The sunset effect or the absolutely crazy rainbow - which goes so absolutely beautifully with the steampunk goggles. I need to know where to get a pair. On another note, these are some beautiful photos. The green of the plant goes so well. Unfortunately, due to the school rules, she had to return it to it's original blonde colour. Anyway, it was good for the photos. 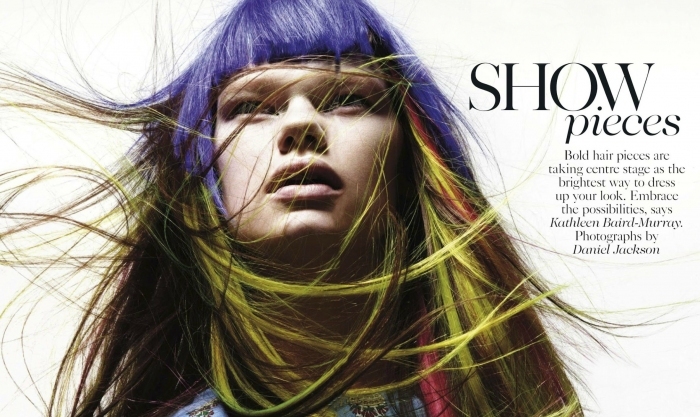 This was from an editorial that appeared in the March 2012 edition of Vogue. What can we get from this? It is not only alternative, but stylish and fun. Either way, these are some absolutely great photos! I especially love the second one, though I am not too sure what is going on in it. It looks like her hair might be about to launch an attack on her. 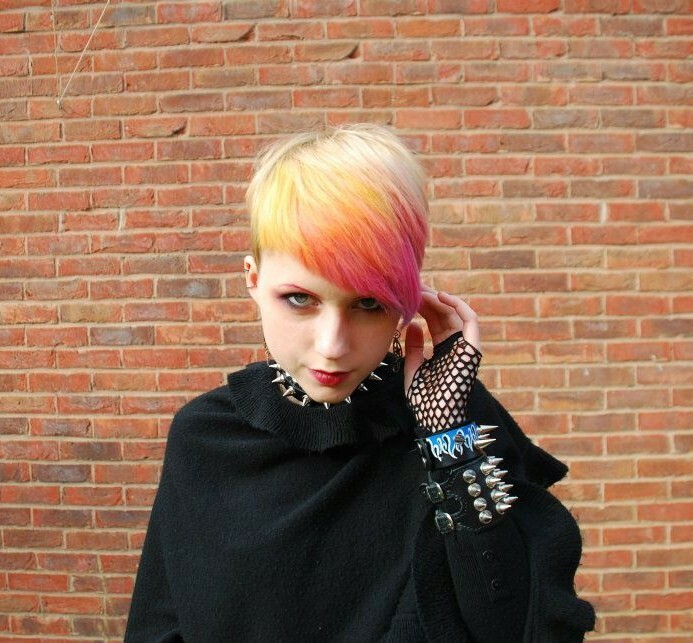 Many people might, of course, think that brightly coloured hair is a fairly modern thing, arriving simultaneously with the arrival of subcultures. However, in 1913-1914, just before World War I, there was a vogue for dyed brightly coloured hair in exotic shades such as blue, violet or emerald. This started in Paris and then spread to other cities such as London. In 1924, the first celebrity hairdresser, Monsieur Antoine, dyed his dog's hair blue (admittedly quite a light blue) An influential client, Lady Elsie De Wolfe Mendl (who was a brilliant, eccentric woman, interior designer and - according to contemporary experts in Paris - the best-dressed woman of 1935) took up the same style and this started a new fad. On a last note, her is Tony Bennett feat. Lady Gaga with 'The Lady is a Tramp' - although I do prefer Frank Sinatra's version, Sinatra is unfortunately void of bright blue hair... and this version is really not at all bad. As an 'extra' on the topic of blue hair = quick facts. Blue hair has been described as a "sacred aesthetic" in ancient Egypt and Mesopotamia, where lapis lazuli was used in funerary art and statuary. Also, many coloured pictorials from the Anglo-Saxon tribes after the departure of Roman troops feature women with blue hair. 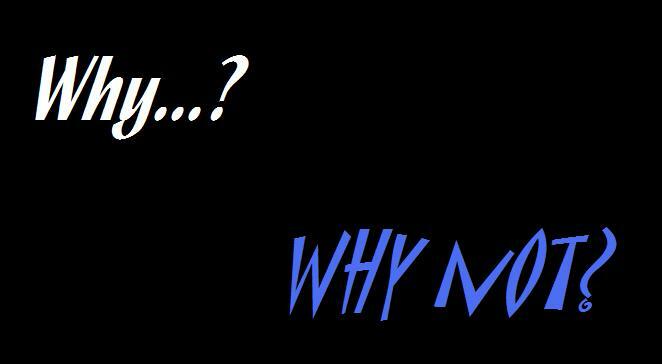 Though, I really don't know why... can anyone enlighten me? Anyway, thank you for reading and please check back soon! Do comment and Please Follow! It's a very interesting style. Why not ? It's very creative and original. Love this post, perfect choice of photos. 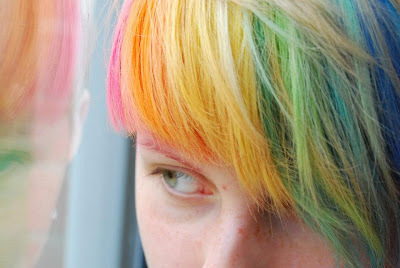 I love these colourful hairstyles! It's funny because although I'd most likely never consider any rainbow colour options for my own hair, I do think it looks great on other people - especially your friend. 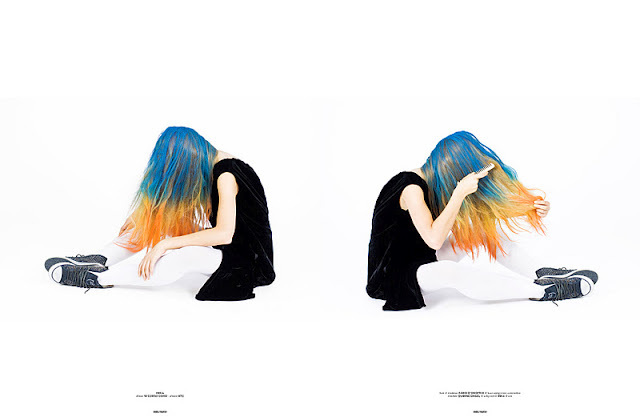 I adore colorful hair so much! And your friend is absolutely gorgeous! Love her hair and style in general. cool hair! I am now following! 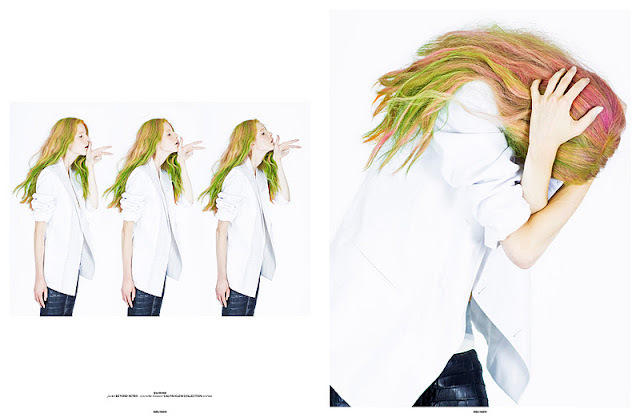 Amazing colored hair! We love every style and colors of them! I love brightly coloured hair! I'm not allowed to have "unnaturally" coloured hair for my job, or I would be jumping on this bandwagon. I love both styles of you friend's hair, and it's a bit sad that she had to change it back for school.